How have you been? Are you ready for Christmas? Panoramic view of Barcelona from Park Güell. After persuading my boyfriend, we reserved a 5-star hotel near the Aveniguda Diagonal (one of the longest and broadest avenues in Barcelona) at the Meliá Barcelona Sarrià. We loved our hotel room as it was overlooking the city and had a spectacular view! The breakfast here was nice and full of choices. We went every day to the gym and walked most of the times to the city centre. We usually like to splash out a little bit more on the accommodation, but if you’re looking for something more economical check out Booking.com for great deals. Our view from our hotel room (15th floor) overlooking the city of Barcelona. Which method of transport did we use? If you’re travelling from Madrid, there’re so many travel options to choose from and depending on your budget you can travel by train (ar. 2:30 hrs), bus (ar. 7 hrs), car (ar. 6:30 hrs) and even plane (ar. 1 hr). Of course it all depends on your budget and convenience. Travelling by train in Spain is very expensive if you don’t book in advance. By plane, it’s not so bad, but you need to board on time and pass through security. This wasn’t an option for me as I had a really bad experience in the past, which was a delay of almost 6 hours! So we went for the cheapest and relaxing option of travelling by bus (we paid ar. 60 Eur per person). We got to watch countless of movies on their touch screens. In the end the time passed by so quickly! In Barcelona, we bought a 10-journey travel card (can be used for multiple persons) for the metro-bus public transport (cost 9,95 Eur). We managed to finish the card. So it’s handy to calculate if you’ll need more for your journey. This was my fifth time visiting this vibrant city, and this is because of my love for Antoni Gaudí’s modernist work! Gaudí (1852-1926) is such an inspiration to me, he inspired me to make some mosaic art pieces. So every time I visit this city I take it upon myself to visit at least one of his works or collaborations. Parc Güell (1900-1914): being the largest work of the mosaic master, it’s no wonder this garden (about 20 hectares) attracts millions of tourists. Highlights of this park is the mosaic (“trencadis“) wavy bench and the mosaic lizard. You can also visit his house, which is now a museum illustrating his lifestyle and love for Barcelona as his house overlooks the city. Casa Batlló (1904-1906): the facade of this colourful building tells an animated story and every shape or structure was inspired by nature. You need a great deal of imagination to see everything come to life and the best part is the rooftop where the dragon rests. La Sagrada Familia (1882-present): a visit to Barcelona is not complete if you haven’t stopped by the Sagrada Familia. As you may know, the construction of this sanctuary is still being done and they hope to finish it in 2026 (a century after his death). You can also visit Gaudí’s crypt. Casa Milà or “La Pedrera” (1906-1912): this building has the most relevant work of Modernism. Gaudí fills every space with details and even on the rooftop he has done an outstanding work. Palau Güell (1884-1887): used to be residential palace of the Count Güell. The interior of this palace has many rich details and the rooftop has Gaudí’s mosaic designs. Since my boyfriend’s birthday was coming up I wanted to surprise him with a Segway tour with Ecomovingrent, which lasted 2 hours. The tour started at the Arco de Triunfo (classic gateway), then we went through the Parc de la Ciutadella and got to admire the Cascada Monumental. Afterwards we stopped at Parc de Carles I, which was a tiny park with a nice outlook of the La Vila Olímpica del Poblenou, the Torre Mafre, the Arts Hotel, the Estació de França (railway station) and even the Torre Agbar from afar. From there, we made our way to the Passeig Marítim and finally stopped at the prestigious Hotel W Barcelona for photos. After passing OneOcean Port Vell, where you will see the mega yachts, we finally passed the Parc de la Ciutadella and finished the tour at our starting point. Plaça de Catalunya: considered to be the centre of Barcelona, is also connected to many well-known streets such as La Rambla and the Passeig de Gràcia. You cannot miss its fountains and statues. La Rambla: it’s probably the most visited street by the tourists. With it’s attractive shops and perfectly lined trees, you’ll definitely want to get a glimpse of this street. Beware of pickpockets! El Raval: this neighbourhood belongs to the district of Cuitat Vella and was also known as “Chinatown.” The point of interest is definitely the Raval Cat (“El Gat de Raval”) by the well-known sculptor Botero. Gothic Quarter: known as the old city of Barcelona, it has some buildings from the medieval period such as the Basílica de la Mercè (“Basilica of Our Lady of Mercy”). Fonts De Montjuïc: the magic fountain show is worth checking out at night, be sure to check the time tables. 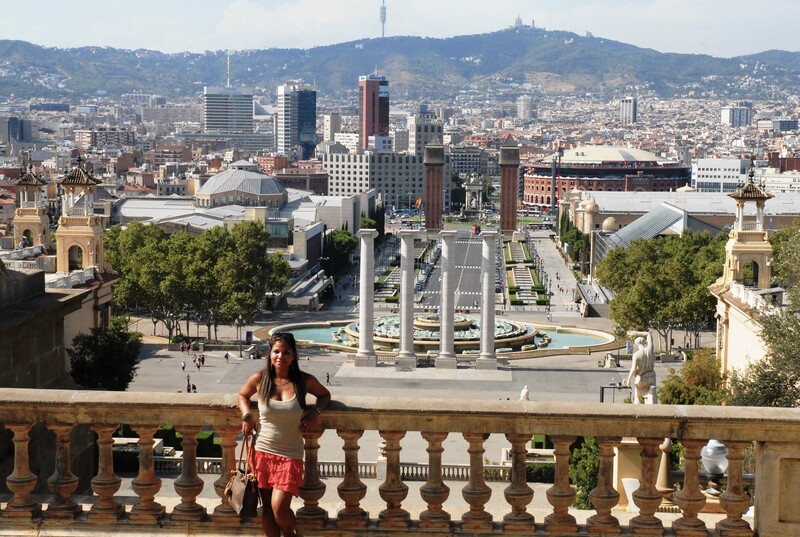 The fountains are situated below the National Art Museum of Catalonia, which is on Montjuïc hill. Near the Museu Nacional d’Art de Catalunya overlooking the Fonts de Montjuïc and more! Still got time on your hands? Camp Nou: if you’re a Barça fan (FC Barcelona), you probably know this football stadium. This is the largest football stadium in Spain, mainly because of its seating capacity (about 99.000). 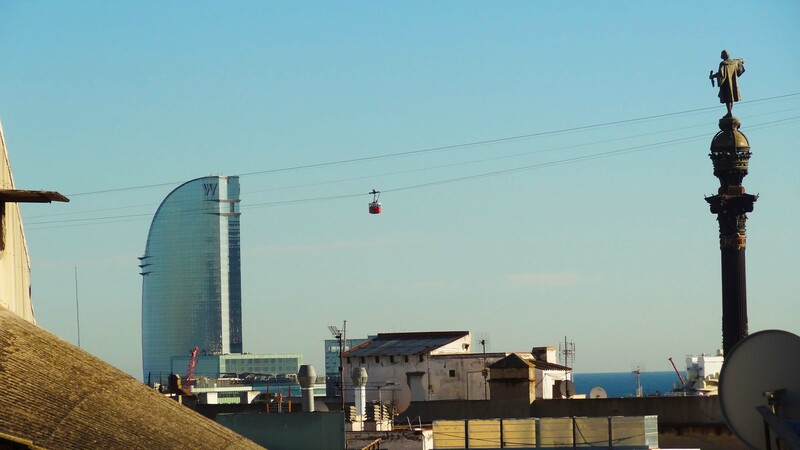 Bunker del Carmel: offers a 360-degree view of Barcelona, best place to watch a sunset! Castell de Montjuïc: this is fortress (built in 1640) on the Montjuïc hill, which has known the Napoleonic wars and other battles. 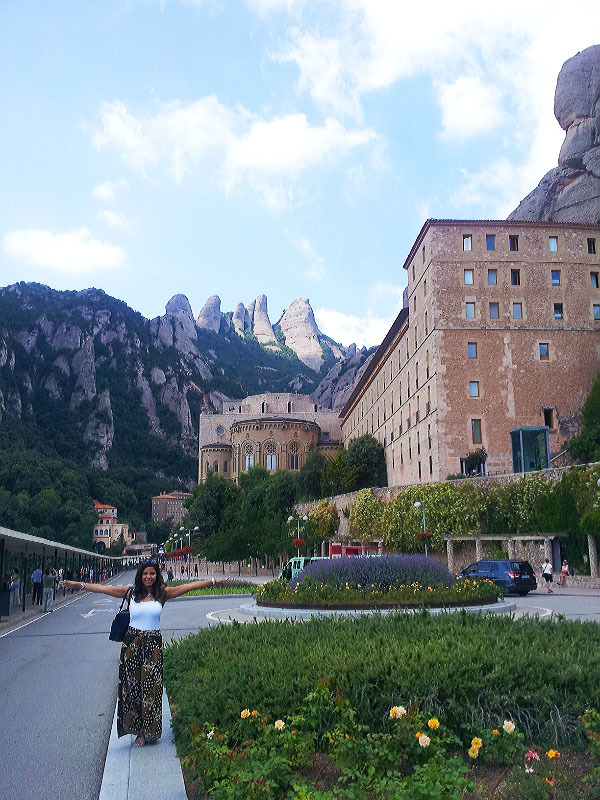 Montserrat: just an hour from the city centre of Barcelona, you can drive up to a mountain range and discovery an abbey, known as the Santa Maria de Montserrat. Don’t forget to pay a visit to the Virgin of Montserrat. At Santa Maria de Montserrat is (a Benedictine abbey). 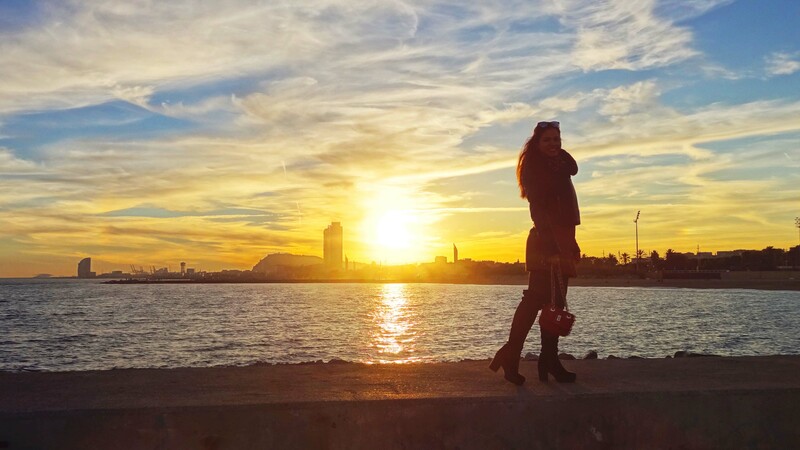 How much time do you need to visit Barcelona? I personally think that if you want to visit this city at a leisurely pace you will need about 7 to 10 days. In the past, I also did a 4-day visit with a friend and we took a Hop-on Hop-off bus, which brought us to the highlights of this city. Of course this depends on the attractions you want to see, and remember to research if you need to book a touristic attraction in advance. Most of the well-known monuments tend to have online reservations such as the Sagrada Familia and the Parc Güell. Avoid long queues and disappointments by booking your spot. Great view at the Palau Güell of the Hotel W, a cable car and the monument of Christopher Columbus. König Barcelona Centre ($): as the name says it, this restaurant is in the city centre and close to the Plaça de Catalunya. This place has an extensive menu from salads, tapas, sandwiches, German sausages and beer. The best thing about this place is that the dishes are cheap. If you want to eat here, then be sure to be there before the busy lunch and dinner times, because people tend to make long queues. It’s definitely worth a try! Bar Restaurante O’toxo 3 Hermanos($): this Galician restaurant is close to the Rambla de Raval and Las Ramblas. For about 9,50 Eur you can get the menu of the day (“menu del día“), which is a 3-course meal and it’s well-worth the money. The best part was their dessert: “crema catalana,” which is a typical Spanish custard and it’s identical to the creme brûlée. Boo Restaurant & Beach Club ($$): this restaurant offers a full range of meals from sea food, paella, grilled meat or fish. Thanks to a close friend we had full-course lunch. I really liked their steamed mussels (starter) and their sea food paella. The setting was perfect, it felt as we were lunching on a ship because of the sea view. 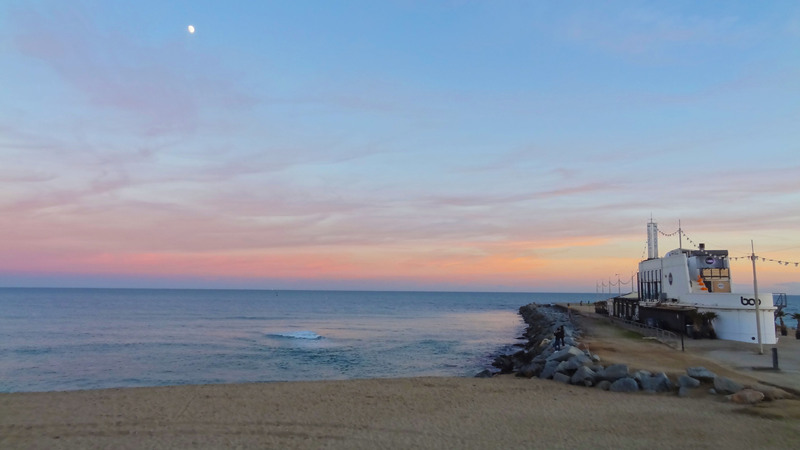 Such a beautiful pink sky at the Boo Restaurant & Beach Club. Looking back on my trip to Barcelona, I must say that we had a really great time! One will never get enough of this city, because there’s so much to see and taste. I’m sure I left out other important highlights, but I named most of the monuments that have peaked my travel interests. Especially the buildings and parks designed by Gaudí are my fave! I am already looking forward to my next visit! What an awesome sunset at Espigó de Bac de Roda. Have you ever been to Barcelona? If yes, which monument or place did you like the most? Have a great, festive weekend!